It's official, the 2019 AMA R/C Aerobatic Pattern Nationals will be held in Blytheville, Arkansas July 16th thru the 20th. 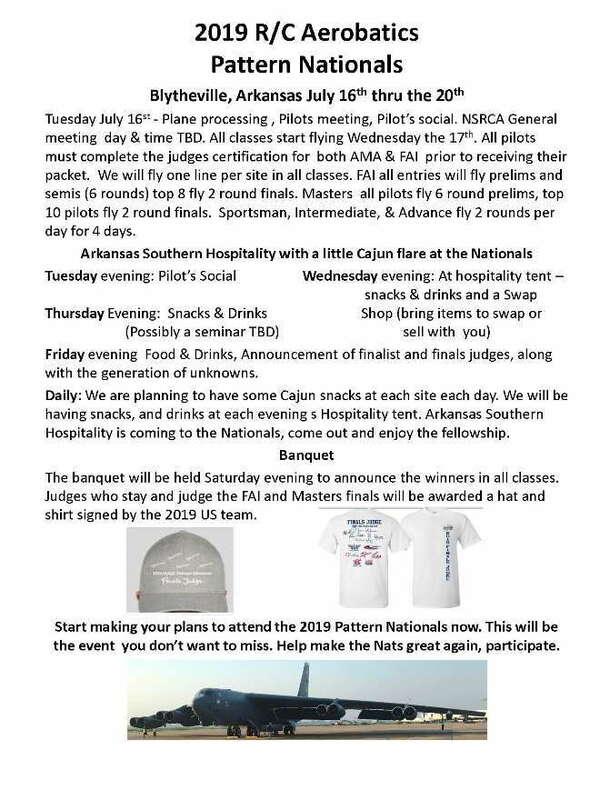 Make your plans to attend, compete against some of the best pilots in the country, and enjoy some Southern Hospitality with a little Cajun flare. Count me in. I am looking forward to it. Can't wait for another epic road trip! Just hope we fly parallel to the runway this time! LOL I'm in either way! Come on over Drac! We can always use another person for the road trip, i'll even give you a place to stay! It's very tempting. Will have to see what happens down the track a bit. Chuck, We will be flying one flight line per site this year, and yes they will be basically aligned with the runway. Pilots facing North, one set of poles per site. Lots of great plans all starting to come together. Going to be a truly memorable event. i was was just poking a little fun at the skewed lines we had the last time! Lol. I am sure you guys are going to put on another top notch event, I am looking forward to it for sure! It was memorable last time. Absolutely! I know I can reach 110mph pulling my trailer with the Suburban! And that the Greek place was the only place to eat! Need to bring a grill for dinner this year. We might have to do that Chris! Try out the Katfish Kastle this year, the food was excellent. Expand your Quest, Be there to be a part of this great event. Here is a link to some articles leading up to the 2019 Pattern Nationals. More articles and information will be added to this site as they are developed along the way to the date of the event. Enjoy. New articles were added to the NSRCA 2019 Nats page on 01/10/19. Here is the format for the 2019 AMA Pattern Nationals. New articles were added to the NSRCA 2019 Nats web site today 02/02/2019. AMA has opened online registration for the 2019 Pattern Nationals. Registrants can visit http://shop.modelaircraft.org/dept.aspx?id=05db47b0-8a08-4624-8db8-3228874d to register. The AMA registration web site is up and running. Be sure to register early. I have posted a new Nats article on the NSRCA web site in the Nats 2019 section on 3/20/19. 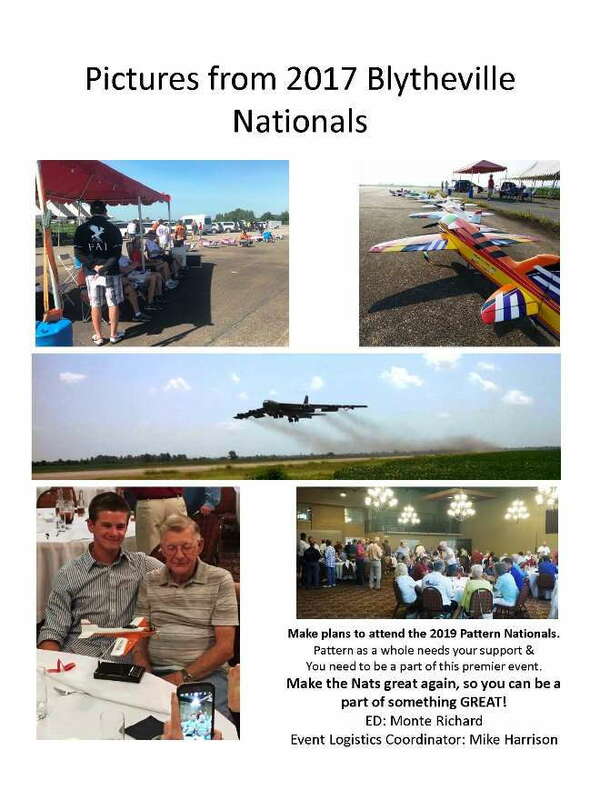 Be sure to check out all the articles about the 2019 Pattern Nationals there. AMA has made some changes to the Nats New starting this year. Here is the jest of it. "We wanted to let you know about a change we are making to NatsNews this year. Instead of producing daily copies of the newsletter and handing them out on-site, we will be producing daily online blogs throughout the workweek. The blogs will include daily reports and photos and members can subscribe to receive email notifications when the blogs are posted, as they did in the past for NatsNews.Because we are not producing daily editions of NatsNews, we will create one online newsletter at the conclusion of each event. We also will have extended coverage of the Nats in the November 2019 issue of Model Aviation.These changes are more cost-effective and are a wiser way to spend members’ dues money. If you haven’t already done so, you can sign up for daily email notifications at www.nats.modelaircraft.org. If you have any questions or concerns please contact Rob Kurek Director of Communications at 765-287-1256 x200 or via email rkurek@modelaircraft.org. " The deadline is getting closer. Now is a good time to register for the Nats. Don't let June 1st come and get left out. Go to the AMA site and register now.